What's more exciting than expecting your first child? Not a whole lot. For me, there's not much that comes close to photographing a pregnant woman in beach sunset maternity session. Tash and Jeff are expecting their first beautiful baby in just a few short weeks. They live in Queensland, in Hervey Bay but Tash is from Sydney and funnily enough, from a suburb very near my house. They were coming to Sydney for Christmas to see family and friends and Tash wanted to book a maternity session with me during their holiday. After chatting to her and reading her pre-session questionnaire I realised that they are very much beach people. 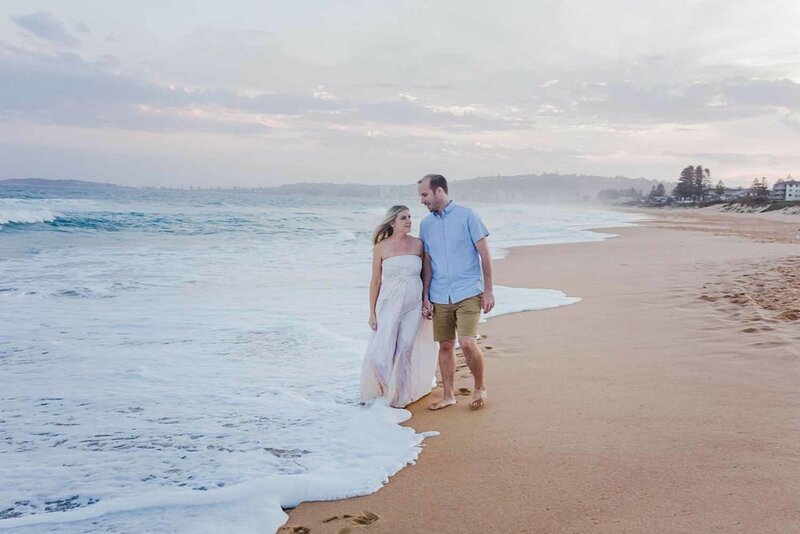 They take their dog to the beach at home in Qld every day so I suggested that we have a beach sunset maternity session. We chose Narrabeen Beach on Sydney's Northern Beaches and it did not disappoint. There was beautiful soft, evening light...my fav type of light! Tash had planned what she would wear very carefully. She brought along two outfits, including a stunning dress by Filly Boo Maternity that sell maternity and breastfeeding dresses. You can see that long white dress in the images below. This mama is stunning, and I am honoured to capture this amazing time in her life. If you would like a Maternity Session of your own, head over here to check out all the details. I would love to document your story!